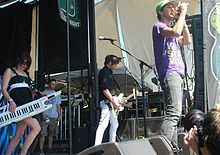 Over ten years, Cobra Starship produced four albums and two Billboard Hot 100 top 10 singles. The group released its debut album, While the City Sleeps, We Rule the Streets in 2006, which contained the single "Snakes on a Plane (Bring It)". The band released its second album ¡Viva La Cobra! on October 23, 2007. Their third album, Hot Mess, was released on August 11, 2009. Their fourth and final album, "Night Shades" was released on August 30, 2011 in the US and October 28, 2011 in the UK. Midtown's management company soon set Saporta up with an opportunity to record a song for the soundtrack to the 2006 Snakes on a Plane. Along with members of The Academy Is..., Gym Class Heroes, and The Sounds, Saporta recorded "Snakes on a Plane (Bring It)", which became a minor hit. During the recording of While the City Sleeps, We Rule the Streets, Saporta began recruiting new members to complete the group's lineup. He first enlisted drummer Nate Novarro, whom he met on tour while Novarro sold merchandise for fellow touring act Hidden in Plain View. After seeing Saporta in Entertainment Weekly, guitarist Ryland Blackinton and bassist Alex Suarez, who lived in the same apartment building as Midtown drummer Rob Hitt, emailed Saporta asking to join the group. The lineup was completed by Victoria Asher. While the City Sleeps, We Rule the Streets, was released October 10, 2006. It featured the single "Snakes on a Plane (Bring It)", of which a video had been featured during the closing credits of the film Snakes on a Plane earlier that summer. In October 2006, they supported Thirty Seconds to Mars on their Welcome to the Universe Tour. On February 17, 2014, Midtown announced that they would be reuniting and performing at the Skate and Surf Festival. As of April 19, 2014, Cobra Starship are back in the studio working on new material for an upcoming release. The band released the single "Never Been in Love" featuring Icona Pop on August 25, 2014. On November 10, 2015, it was announced in a blog post on their website that they had broken up. Andy Barr began touring with classic rock band America in October 2016. ^ "Cobra Starship — After many incredible years, I'm making the...". cobrastarship.com. Retrieved 2015-11-10. ^ a b c d Manley, Brendan (2008-06-03). "Fangs for the Memories" (PDF). Alternative Press. Alternative Press Magazine, Inc. Retrieved 2010-10-20. ^ a b ¡Viva la Cobra! (CD liner). Cobra Starship. Fueled By Ramen/Decaydance. 2007. 0015133-02. ^  Archived June 4, 2007, at the Wayback Machine. ^  Archived November 24, 2009, at the Wayback Machine. ^ Keagan Ilvonen. "Midtown Reunite - News Article". AbsolutePunk.net. Retrieved 2015-04-03.